Retinal and Macular Disorders — McKnight Eye Centers, P.C. The Macula is a very small and important part of the retina that is responsible for central vision. It is much more sensitive to detail when compared to the rest of the retina. The Macula is the part of the eye which helps you see to read street signs, to thread a needle, and to read small print as well as many other small, detail oriented tasks. There are various diseases that affect the retina and macula. The most common being age-related macular degeneration (AMD). AMD occurs as a very common part of the aging process. Prevalence is high in individuals 50 years of age and older. AMD is the leading cause of blindness for the elderly in the United States. Macular Degeneration is caused by deposits of accumulated extracellular material that builds up between Bruch’s membrane and the Retinal Pigment Epithelium of the retina. These deposits are yellow or white in color and they are called drusen. Most people over 40 will have some hard drusen. A healthy eye can even have a few small drusen which should be monitored closely for changes. When the deposits become larger, both in size and number, it is a sign of development of the dry form of age related macular degeneration. Dry AMD may advance to the wet form in some cases. The wet form of AMD is caused by the abnormal growth of blood vessels under the retina. These vessels develop due to vascular endothelial growth factor (VEGF). VEGF is a signal protein produced by cells stimulating vasculogenesis and angiogenesis. VEGF’s normal function is to create new blood vessels during embryonic development, after an injury or in various other scenarios. Overexpression of VEGF is what causes the wet form of macular degeneration. There are two types of age-related macular degeneration, The dry form and the wet form. The “dry” form of macular degeneration occurs when the macula contains drusen only. Symptoms of Dry AMD are typically more mild in nature. It advances much more slowly and any vision loss is typically much less severe than in wet macular degeneration. Dry macular degeneration may only affect one eye. If only one eye is affected a person may not notice symptoms at all because the other eye will compensate for the vision loss caused by the disease. There is no cure for the dry form of macular degeneration. However, a large scientific study has shown that the antioxidant vitamins lutein, zeaxanthin and zinc may help to slow the progression of the disease. All patients should talk with their eye care provider before taking any supplements. It is possible for the dry form of macular degeneration to advance and change into the wet form of macular degeneration. Patients diagnosed with dry AMD will need to closely monitor their vision with regular visits to the ophthalmologist and with home monitoring of vision changes with an amsler grid. The “wet” form of macular degeneration is caused by the growth of abnormal blood vessels within the layers of the retina. The wet form is much more damaging and vision threatening as compared to the dry form. 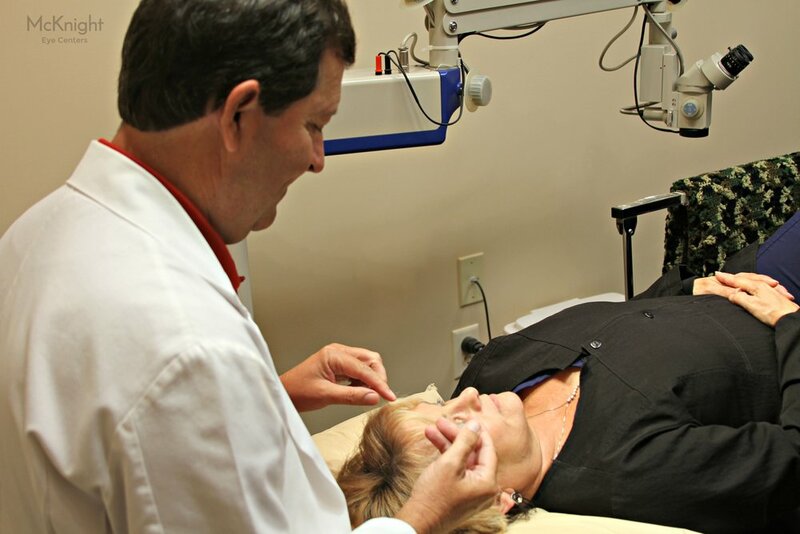 It typically progresses much faster and requires closer monitoring by an ophthalmologist who will provide treatments which hope to slow the progression of the disease and improve vision. Wet macular degeneration is treated in various ways including Anti-VEGF medication injected into the eye. Injections are a common treatment to aid in slowing the development of the abnormal blood vessels which cause wet macular degeneration. Anti-VEGF medication targets the vascular endothelial growth factors causing abnormal blood vessel growth. There are various medications used in the treatment of wet AMD such as Avastin, Eylea, Lucentis, Triessence, Iluven, and Ozurdex. Talk with your ophthalmologist to find the medication that is right for you. Who is at risk of developing macular degeneration? If you or a member of your family has recently been diagnosed with AMD or has further questions concerning macular degeneration please call and make an appointment with our office for a complete dilated eye exam. It is helpful to write down your symptoms and questions to share with your doctor so your doctor can understand the severity of your symptoms and answer any questions you may have concerning your vision.